A wooden honour roll commemorates those who served in World War One. It lists 12 names. On Sunday, in the presence of a large congregation, the roll of honor was unveiled in the Wilmot Church of Englandby the Rev. W. Best, assisted by the Rev. Sinclair. After the unveiling ceremony, a forceful and interesting address was given on "Sacrifice" by the Rev. Sinclair. The board, which is a beautiful piece of work, is of polished blackwood, bearing on the top the inscription. "For King and Country," and the Allies' flags. At the bottom is the text, "Greater love hath no man than this, that he lay down his life for his friends." 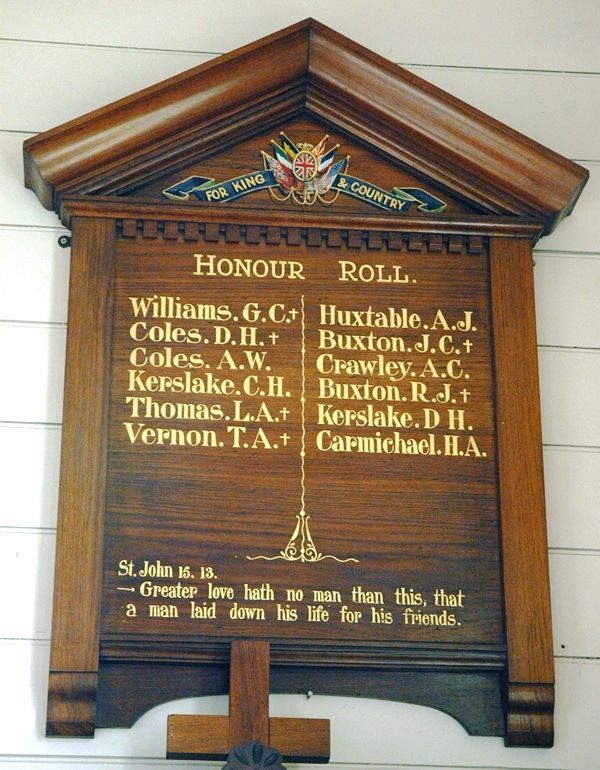 The board bears the names of the 12 members of the Wilmot Church of England who enlisted, six of whom have made the supreme sacrifice. Advocate (Burnie), 28th May 1919. Greater love hath no man than this that a man laid down his life for his friends.